[as in David's time] that built cities and made contacts with surrounding nations"
(Biblical Archaeology Review, May-June 1995, pp. 33,35). David was originally headquartered in Hebron, in southern Judah, but now, with all 13 tribes accepting his rulership, he needed a central base from which to govern. An ideal place was on the northern border of Judah, the city of Jebus, also called Jerusalem, but it was in the hands of the Jebusites, a remnant Canaanite tribe that had heavily fortified the city. "And David and all Israel went to Jerusalem, which is Jebus, where the Jebusites were, the inhabitants of the land" (1 Chronicles 11:4). A few centuries earlier, Joshua had attempted to conquer the city of Jebus but had failed. "As for the Jebusites, the inhabitants of Jerusalem, the children of Judah could not drive them out; but the Jebusites dwell with the children of Judah at Jerusalem to this day" (Joshua 15:63). After Joshua's death the Israelites briefly conquered Jerusalem. "Now the children of Judah fought against Jerusalem and took it; they struck it with the edge of the sword and set the city on fire" (Judges 1:8). Yet the surviving inhabitants soon rebuilt the city. From that moment they successfully resisted Israelite attacks until the time of David. "But the children of Benjamin did not drive out the Jebusites who inhabited Jerusalem; so the Jebusites dwell with the children of Benjamin in Jerusalem to this day" (Judges 1:21). The city was built on a mount in the midst of a large valley in the Judean mountains. It seemed impenetrable. When the Jebusites noticed David and his men were ready to attack them, they mocked their feeble efforts. "And the king and his men went to Jerusalem against the Jebusites, the inhabitants of the land, who spoke to David, saying, 'You shall not come in here; but the blind and the lame will repel you,' . . ." (2 Samuel 5:6). An artist's rendering shows Jerusalem as it may have appeared when David made it his capital. The city is connected by a narrow ridge to Mount Moriah, future site of the temple, in the background. Eventually the ridge was expanded and the entire area was called Mount Zion. At lower right, a procession bearing the ark enters the city. the Achilles' heel of the Jebusite defenses, a hidden water shaft that wound its way up into the city. Such a shaft for transporting water was a common feature of many fortified cities of that time. 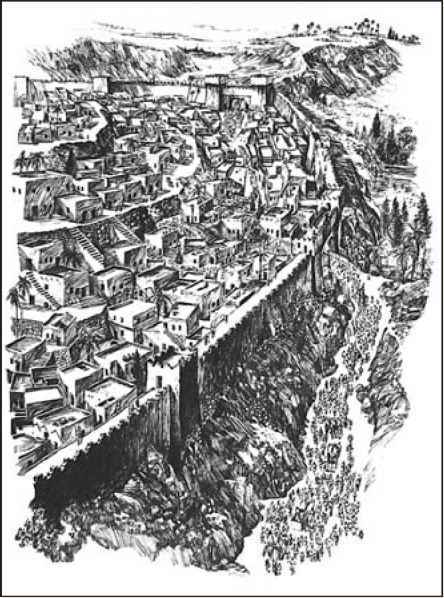 "As was characteristic of all the great walled cities of Canaan," notes Eugene Merrill, "Jerusalem had a vertical water shaft connecting with a tunnel leading to an underground water supply outside the walls. As necessary as these systems were for the survival of a city under siege, they also constituted a major weakness in that they provided access into the city for anyone who could find the entrance" (Kingdom ofPriests, Baker Book House Co., Grand Rapids, 1987, p. 236). In 1 Chronicles 11:6-7 we find who gained the honor: "And Joab the son of Zeruiah went up first, and became chief. Then David dwelt in the stronghold; therefore they called it the City of David." More than a century ago Charles Warren, a British officer, found a water shaft in Jerusalem with features similar to those described in the Bible account. Charles Pfeiffer, a professor of ancient literature, explains the significance of the discovery. "The capture of Jerusalem by David is of interest to archaeologists," he wrote, "since he used a strategy which involved the Gihon Spring, on the eastern slope of Mount Zion ... Joab went up first and was rewarded by becoming commander of David's army . . .
Jebusite wall farther down the slope toward the Gihon Spring increases the possibility that Joab could have secretly entered the city ... through Warren's Shaft" (The Biblical World: A Dictionary ofBiblical Archaeology, 1966, Baker Book House, Grand Rapids, p. 373). After David conquered the Jebusite fortress, it became known as the City of David. As his reign prospered he soon began building to extend the city. "Then David dwelt in the stronghold, and called it the City of David. And David built all around from the Millo and inward. So David went on and became great, and the Lord God of hosts was with him" (2 Samuel 5:9-10). Mount Moriah, which David bought from Ornan the Jebusite. "Therefore, the angel of the Lord commanded Gad to say to David that David should go and erect an altar to the Lord on the threshing floor of Ornan the Jebusite... So David gave Ornan six hundred shekels of gold by weight for the place. And David built there an altar to the Lord, and offered burnt offerings and peace offerings, and called on the Lord; and He answered him from heaven by fire on the altar of burnt offering" (1 Chronicles 21:18,25-26). 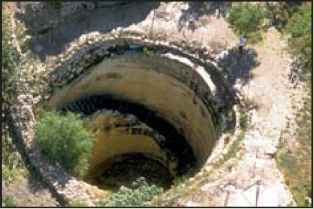 The Pool of Gibeon was a massive 37-foot diameter shaft cut into solid rock to reach the water table 82 feet below. Saul's sons. Abner brought his army to fight David's army, led by Joab. Abner's and Joab's troops met beside a famous water supply of that day called the pool of Gibeon. "And Joab the son of Zeruiah, and the servants of David, went out and met them by the pool of Gibeon. So they sat down, one on one side of the pool and the other on the other side of the pool. Then Abner said to Joab, 'Let the young men now arise and compete before us.' And Joab said, 'Let them arise.' So they arose and went over by number, twelve from Benjamin, followers of Ishbosheth the son of Saul, and twelve from the servants of David. And each one grasped his opponent by the head and thrust his sword in his opponent's side; so they fell down together. Therefore that place was called the Field of Sharp Swords, which is in Gibeon. So there was a very fierce battle that day, and Abner and the men of Israel were beaten before the servants of David" (2 Samuel 2:13-17). James Pritchard conducted an exploration of this site from 1956 to 1962. He discovered 31 jar handles bearing the Hebrew name Gibeon, which confirmed the site. Early in his search archaeologist Pritchard located a round water shaft, 37 feet in diameter, that led to a pool used by the city. This shaft, comments Biblical Archaeology Review, "was cut into the limestone bedrock to a depth of over 82 feet. Also cut into the limestone are a staircase and railing, which wind down to a level floor about halfway to the bottom of the shaft. From there, the stairs drop straight down another 45 feet—to the level of the water table" (May-June 1995, p. 43). In the same issue archaeologist Bryant Wood concludes: "A large pool at Gibeon is no doubt the pool where the forces of Israel's second king, David, fought under Joab against the forces of Saul's son Ishbosheth under Abner" (p. 33). This find was listed by Biblical Archaeology Review as one of the top 10 discoveries in biblical archaeology. It reveals yet another example of the accuracy of even the incidental details of the biblical account. Ornan the Jebusite" (2 Chronicles 3:1). In Solomon's time the Israelites finally completed an earthwork that filled the area between the two mounts, making them one. The whole area was then called Mount Zion and was no more known as Moriah. "With the establishment of the ark first in the Jebusite fortress and then in the newly built temple," according to one source, "Zion became known as the sacred dwelling place of Israel's Lord, the One 'who dwells in Zion' (Ps. 9:11)" (The International Standard Bible Encyclopedia, 1982, Vol. 4, p. 1198). Eventually Zion would be used not only to denote the temple area, but as a symbol for Jerusalem, its inhabitants and, finally, the people of God. Some historians and critics have questioned the existence of King David and have relegated Old Testament accounts about him to the status of mythology. "I am not the only scholar," remarks Philip Davies, "who suspects that the figure of King David is about as historical as King Arthur" (Biblical Archaeology Review, July-August 1994, p. 55). Such professors cast doubt on the reliability of the biblical record and undermine the faith of others. They also rarely acknowledge the many discoveries that have corroborated the biblical account. For instance, in 1993 archaeologists discovered the names of David and Israel in an inscription carved in stone only 100 years after David's death. Reports Biblical Archaeology Review: "It's not often that an archaeological find makes the front page of the NewYork Times (to say nothing of Time magazine). But that is what happened last summer to a discovery at Tel Dan, a beautiful mound in northern Galilee, at the foot of Mount Hermon beside one of the headwaters of the Jordan River. March-April 1994, p. 26). 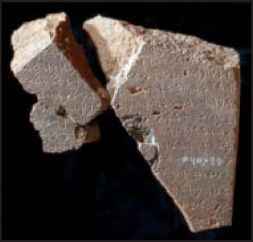 More and more extrabiblical evidence involving Bible names and places is being discovered as the years go by. The skeptics are gradually having to retreat. Later another scholar found the name "House of David" in the inscriptions of the famous Moabite Stone, also called the Mesha stela, dated to the ninth century B.C., about 100 years after David's reign. It is hard to understand how David's name could appear in historical records if he were nothing but a later literary creation. Anson Rainey, professor of ancient Near Eastern cultures, cautions the unwary about believing that the accounts of David and other biblical characters are but legends. "As someone who studies ancient inscriptions in the original, I have a responsibility to warn the lay audience that the new fad, the 'deconstructionist school,' . . . is merely a circle of dilettantes. Their view that nothing in Biblical tradition is earlier than the Persian period [540-330 B.C. ], especially their denial of the existence of a United Monarchy, is a figment of their vain imagination. The name 'House of David' in the Tel Dan and Mesha inscriptions sounds the death knell to their specious conceit. Biblical scholarship and instruction should completely ignore the 'deconstructionist school.' They have nothing to teach us" (Biblical Archaeology Review, November-December 1994, p. 47). Although some critics will not admit as much, the accumulating physical evidence confirms rather than denies what is written in God's Word. But, for those who have faith in what God has said in the Bible, it is not necessary to find material remains to corroborate these accounts. The apostle Paul boldly affirms that God "cannot lie" (Titus 1:2). However, in some cases physical evidence of the events and people described in the Scriptures has survived the ravages of time and serves as a witness to His faithfulness. This comforts and consoles us in our faith, as Paul wrote, "for whatever things were written before were written for our learning, that we through the patience and comfort of the Scriptures might have hope" (Romans 15:4).